Most people get their information about solar & dealers from solar websites. But most of these are full of errors and bad advice. They sell your contact information to poor-quality dealers who then pester you endlessly. There are hundreds of solar websites; it's a confusing scene. To help consumers navigate it, here is the only overview and review of them that I know of. Nearly all solar websites aimed at solar shoppers are of one of two types. The first type are websites that have you fill in your bills or electricity usage and show very rough estimates of your costs and/or savings on their websites. At the moment, there are 7 such websites that are at all prominent. All but one require that you provide your physical address. Most make no promises about how they will use it. Two require your phone number and email, and you are very likely to be contacted repeatedly. The second type includes many sites that look like they're going to estimate your costs and/or savings on their website, but they don't. They all demand your email address, and most demand your phone number as well. After you fill in your bills or usage, a new screen tells you that you'll receive your results - and usually quotes - by phone or email. Some don't even offer to estimate your costs or savings, but just try to get your contact information with the promise of quotes to come. Most of these sites lead to bombardment by sales calls, emails, letters, and even door knocking. At the moment, there are around 40 such websites that are easy to find. The remaining solar websites are either highly technical or governmental. They will be described below. Since most solar shoppers rely on one or more of these websites for information about solar, advice on solar shopping, and referrals to solar vendors for quotes, I thought it would be helpful to give people a heads-up about them, lest they have to learn the hard way. I don't mean to suggest that all, or even any, of these websites and the companies behind them are deliberately giving shoppers bad information or advice, or trying to take advantage of them. Many of them are probably very well-intentioned and genuinely want to help the spread of residential solar. But most of the solar industry is full of errors, misinformation, out-of-date facts, wrong-headed advice, bad mathematics, and simplistic analyses. It is still a young industry, mostly unorganized and undisciplined, so these things are to be expected until it matures. But this plethora of bad information sourced by the industry is picked up by news organizations, nonprofits, government agencies, and solar dealers. Then it is widely copied all over the Internet, often with the best of intentions, and quickly becomes "conventional wisdom," even though it was never right in the first place. Getting to the true facts about solar isn't easy. The main sites you'll run across that show estimates online are Energy Sage, Find Solar (a subsidiary of Solar Estimate), Google Project Sunroof, MySolar Toolkit, Pick My Solar, Power Scout, Solar Nation, and Solar to the People. I haves checked the calculators on these sites thoroughly. So have other industry experts. They have been found to be highly unreliable. No wonder they use disclaimer terms like "ballpark or rough estimate." All of them apparently are using simplistic algorithms and models for calculations. Most exaggerate or hide their underlying assumptions, such as how fast utility rates will increase. Some use satellite maps, which sometimes show the wrong house, are often years out of date, and seldom reveal shading accurately. Most neither ask you for nor tell you which panels they're basing their estimates on, utility rate details (time of use schedules, net metering, minimum charges), inflationary effects, good or bad financing choices, or your assumed tax status . But these factors usually play a large role in your costs and savings. ​And, of course, they are not specific to SCE customers, so they must generalize results over broad areas of the country and many different utilities with highly variable rate schemes. Their objective should be (although it often isn't) to size the system for your house so that your bills for the next 20 years will be zero. This is a very difficult calculation to make, even just for SCE. To make it for every utility in the country is nearly impossible. No wonder they often either exaggerate or undersize the size of system you need. As a result of all these factors, their costs & savings estimates are usually very inaccurate. I've seen many cases that are off by tens of thousands of dollars. Most of these websites push for your phone number to get more than the bare minimum of information and to get real quotes. If you provide it, you may also be required to waive your Do Not Call Registry listing and give your consent to a barrage of phone calls and text messages from dealers, call centers, and robocalls. As a prominent example of a disguised lead-generation website, Google's Project Sunroof charged solar companies a fee to become "Google Sunroof Partners." Then it charged them again when they had to bid against the other "Partners" for leads from Google. There were never more than a few national "Partners," because local dealers and installers couldn't afford Google's fees. Obviously, this didn't result in solar shoppers being referred to the best vendor or installer in their area, but only whichever "Partner" bid the most for their lead. Google has recently given up on this deceptive and consumer-unfriendly model, leaving only their inaccurate calculator in place and a link to shuffle shoppers back to their search results, prominently feature up to 8 Google ads per page. Part of its decision was based on the fact that 3 of its initial 5 partners (SunEdison, Sungevity, and NRG) went broke. Several of these websites call themselves "solar marketplaces." They offer to get you quotes online without a site visit from a dealer. They make their money by charging their dealers a commission. Dealers have to recoup these costs somehow. Guess who pays. And they claim to be highly selective in their dealers, but they actually work with hundreds. But these quotes are practically worthless, for the following reasons. First, without a site inspection and shading study, no dealer can give an accurate quote and no dealer will stand behind such a quote. They play on consumers' fears of having someone come to their house, pretending it is unnecessary. But getting a site inspection and shading study doesn't mean you have to be subjected to a sales pitch. It should just be checking out your house so that a meaningful quote can be prepared. Second, the system size quoted is almost assuredly wrong. Third, they don't specify what brands and models of equipment you're getting. Fourth, these are likely to be poor-quality installers. Fifth, the whole financing question hadn't been touched, so you are susceptible to pressure from vendors to accept financing that profits them, not you. Because of the difficulty of comparing quotes (explained in "How Not to Shop for Solar," trying to make a decision by looking at multiple solar quotes isn't really comparison shopping at all. The quotes aren't apples to apples. Although it's tempting to think shopping for solar online can be done successfully in the same way as shopping for airline tickets online, it really can't. The second type of solar website gathers information about your electricity bills and usage but withholds the results online. The main sites you'll probably encounter in this category include Energy Informative, Geostellar, Lets Go Solar, Pure Energies, Solar Estimate, Solar Power Authority, Understand Solar, and the websites of nearly all manufacturers and dealer/installers. Some pretend to offer online estimates, but after you fill in information you find out that the only way to get your results is to leave your phone number and wait for it by phone or email. Bait and switch. Like most solar websites, once you provide your phone number, you're in for it. Some of these sites claim to find you a high-quality dealer, but this is highly unlikely, sunce there aren't many good dealers, and most of these sites make their money by selling your information to as many dealers as they can. You are likely to be pestered for a long time. There are also a few solar calculators that require you to already know the technical details of the system you need. That mostly defeats their purpose for solar shoppers, who are trying to find out the size of system they need and what it will cost and save them. These sites include CSI-EPBB, Michael Bluejay, Solar-Estimate (their estimator, not their calculator), SRoeCo, MapDwell (only for San Francisco in California), and PV Watts. Of these, only PV Watts can be safely relied on for accuracy, and it's really only useful for one thing: estimating how much energy per year a given PV system will produce at a particular location. Even to get that right, you need to know more about the system being checked than most consumers will ever find out. How to use PV Watts properly and get accurate results is explained in the Solar Buying Guide - Step 3. There are many federal and state governmental websites trying to inform people about getting solar. But, like the for-profit sites, the information on these sites is often very inaccurate and much of their advice is counterproductive. The same holds for the many websites owned by nonprofit organizations, both solar-advocacy groups and industry trade organizations (especially these). Most are well intentioned but poorly researched and merely repeating "conventional wisdom" about solar. You really shouldn't trust most of what you read on most solar websites. The certificates, seals, partners, and so on don't guarantee accuracy. The testimonials from their users may be genuine, but how much do those users really know about solar? Buyers may honestly think they got a good deal, when it was anything but. It's a shame to have to paint such a bleak picture, but those are the facts. As mentioned above, it's not because most of the people involved aren't well-intentioned and honest. It's just the state of the art in the solar industry right now. But it would be a big mistake to avoid getting a solar-PV system now (if it makes sense for you) because of these warnings. There are ways to avoid each and every one of these pitfalls. That is why I published my website, and that is why I offer Buying Guides and personal help by phone or email (see contact information in footer or details on Home Page. It's embarrassing to be tooting my own horn here, but since this is a fairly new website, there's hardly anyone one else to do it yet. I hope that as people read the results of my research and use my Buying Guides and advice service, they will tell others how worthwhile the information and advice has been. Until then, I must explain the differences myself. 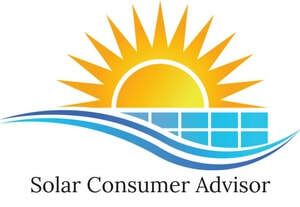 Solar Consumer Advisor's website and Buying Guides were developed specifically in response to these problems for SCE solar shoppers and the shortcomings of solutions available. The information is as fully up-to-date and accurate as I know how to make it. The advice is as technically and financially sophisticated and sound as I can provide. I believe it is the very best available. The Solar Panel Cost & Savings Calculator shows your real costs and savings in the short-, medium-, and long-term, immediately, right on the page. And you don't have to reveal any contact information in order to use it. It is as accurate as is presently possible and takes every factor into account. It also reveals all its assumptions and explains how you can modify the estimate to be a more precise fit for your home. It isn't perfect, and you may get an even better estimate of system size needed and annual electricity produced from a top-quality dealer, but it's an excellent place to start and cross-checks the dealers' figures. * “As the Push for Solar Increases, So Do the Scams, Sketchy Sales Tactics,” Orange County Register, Oct. 5, 2015. ​Next, please see the third and final article in the introduction to and overview of solar shopping: "The Right Way to Shop for Solar." There really is a "right" way, and it will save you time, effort, and loads of money.